4. St. Laserian’s Catholic Church is a large T barn building with a date stone of 1793, although the present structure probably dates from 1830. The church is painted and rendered with plain, pointed windows and one square-headed, granite door case. 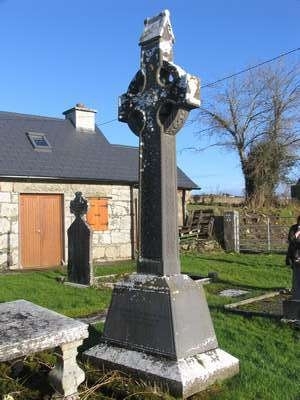 In the churchyard you can see a large replica of a nineteenth century high cross erected by Patrick Francis Moran to commemorate his parents. 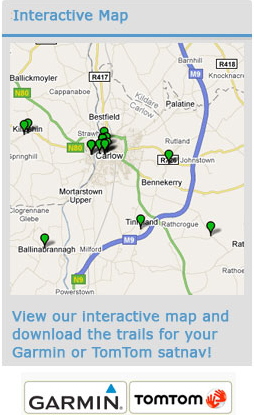 Patrick Francis Moran was born in Leighlinbridge in 1830 and attended school at Ballinabranagh (see St. Patrick’s Trail). He was orphaned at age eleven whereupon he was taken to Rome by his uncle, Paul Cullen, who was Rector of the Irish College there. Moran was granted his doctorate at the age of 22 and ordained one year later. He returned to Ireland in 1866 and was appointed Bishop of Ossory in 1872. He spent 12 years in Kilkenny before moving to Australia to take up the position of Archbishop of Sydney. He became a Cardinal in 1885 and spent the rest of his career in Australia. When he died in 1911 at the age of 81, a quarter of a million people witnessed his funeral procession through the centre of Sydney. He is buried in St. Mary’s Cathedral, Sydney a church built by John Therry, a Carlow College graduate. Both their graves can be seen in the crypt of Sydney Cathedral. Barn-church: Church built to a simple T plan with a large internal space. This style was often used by the Catholic Church in the early nineteenth century.